My Ebay find this week. 4 nice brass United Bank coasters. The United Bank of Colorado was the largest bank in Colorado when Norwest acquired it in 1991. Kathee was a United Bank employee. The Cash Register Building, now the Wells Fargo Tower, was the HQ. This building was the site of the famous Father's Day Massacre. 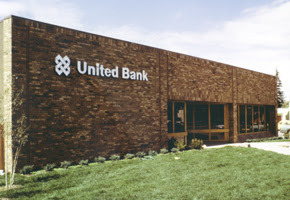 The United Bank logo was still on our Greenwood Village IT center when we worked there.